"Sampath Speaking" - the thoughts of an Insurer from Thiruvallikkeni: Juanito, Gauchito, Ciao, Ato, Zakumi, (Appu) ..... to "Fuelco"
Juanito, Gauchito, Ciao, Ato, Zakumi, (Appu) ..... to "Fuelco"
My fascination for pachyderms knows no limits and I have posted many on the big, majestic, powerful tuskers. Kutinarayanan shot to fame when he was only six …… before that can you connect - Juanito; Tip and Tap; Gauchito; Naranjito; Pique; Ciao; Ato, Kaz and Nik; Zakumi… and what would complete that list…. One does not get to see them often - Armadillos are placental mammals with a leathery armor shell. The Dasypodidae are the only surviving family in the order Cingulata, part of the superorder Xenarthra, along with the anteaters and sloths. The word armadillo means "little armored one" in Spanish. About 10 extant genera and 20 extant species of armadillo have been described, some of which are distinguished by the number of bands on their armor. Their average length is about 75 cm (30 in), including tail. The giant armadillo grows up to 150 cm (59 in) and weighs up to 59 kg (130 lb), while the pink fairy armadillo is a diminutive species, with an overall length of 12 to 15 cm (5 to 6 in). All species are native to the Americas, where they inhabit a variety of environments. Armadillos originated in South America; due to the continent's isolation, they were confined there for most ages. Most of extant armadillos species are still present in South America. They are particularly diverse in Paraguay (where eleven species exist) and surrounding areas. Many species are endangered. The IPL is drawing to a close and time to think of other sports as well. Bencic, junior champion here 12 months ago, showed in the first set in particular why she is regarded as one of the game’s outstanding prospects. She is a Swiss tennis player of Slovak descent. ~ and more to follow in the form of 2014 FIFA World Cup - the 20th FIFA World Cup, scheduled to take place in Brazil from 12 June to 13 July 2014. It will be the second time that Brazil is hosting the competition, the previous being in 1950. Brazil was elected unchallenged as host nation in 2007 after the international football federation, FIFA, decreed that the tournament would be staged in South America for the first time since 1978 in Argentina. The national teams of 31 countries advanced through qualification competitions that began in June 2011 to participate with the host nation Brazil in the final tournament. A total of 64 matches are to be played in twelve cities across Brazil in either new or redeveloped stadiums, with the tournament beginning with a group stage. For the first time at a World Cup Finals, the matches will use goal-line technology. With the host country, all world champion teams since 1930 (Uruguay, Italy, Germany, England, Argentina, France and Spain) have qualified for this competition. Spain is the defending champion, having defeated the Netherlands 1–0 in the 2010 World Cup final to win its first World title. The ‘tatu-bola’, an armadillo that defends itself from predators by rolling up into a ball, was chosen as the official mascot by FIFA at a ceremony organised by the local organizing committee in September 2012. It was selected from 47 designs created by six Brazilian agencies after market research showed its appeal to the primary target audience of Brazilian children aged 5–12. 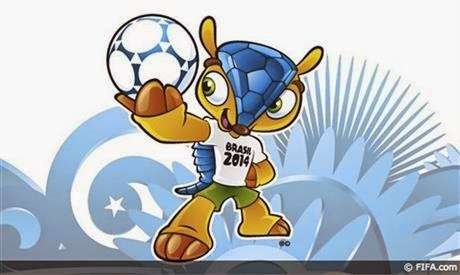 The then-unnamed mascot was first unveiled to the public during a segment of the Brazilian news show Fantástico. An online public vote was used to determine the name in which three potential names were offered, with the winning name being announced on 25 November 2012. 1.7 million people (about 48 per cent) voted for Fuleco, ahead of Zuzeco (31 per cent) and Amijubi (21 per cent). "Fuleco" is a portmanteau of the words "Futebol" ("Football") and "Ecologia" ("Ecology") (in addition, nicknames ending with -eco are popular in Brazil). Fuleco, the Armadillo - official mascot of the 2014 FIFA World Cup is a three-banded armadillo, a species of armadillo which is native to Brazil and categorized as a vulnerable species. He is portrayed to be cheerful, appealing character widely thought to represent the words, 'Brazil', 'Nature', 'Friendly' and 'Passion for Football'. The mascot, with its message of environmental concerns, the ecology and the sport is turning out to be very popular with football teams around the world. It is growing its popularity by representing Brazil by visiting international tourism fairs and other sports, cultural and entertainment events in all continents, while also travelling along with the FIFA World Cup Trophy Tour by Coca-Cola. Armadillos are often used in the study of leprosy, since they, along with mangabey monkeys, rabbits and mice (on their footpads), are among the few known species that can contract the disease systemically. They are particularly susceptible due to their unusually low body temperature, which is hospitable to the leprosy bacterium, Mycobacterium leprae. Humans can acquire a leprosy infection from armadillos by handling them or consuming armadillo meat. 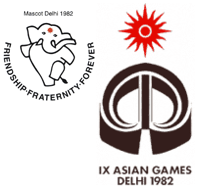 As old timers would fondly recall, the 9th Asian Games were held from November 19, 1982 to December 4, 1982 in Delhi. A total of 3,411 athletes from 33 National Olympic Committees (NOCs) participated in these games, competing in 196 events in 21 sports and 23 disciplines. ‘Appu’ the elephant was the mascot for this. Kerala, the land of pachyderms, had sent 34 elephants as part of its contingent for the cultural procession to be held prior to the opening of the Games. The 6 year old Kutti Narayanan shot to fame as its playfulness attracted the then Prime Minister Indira Gandhi and her son Rajiv Gandhi. It was to be the ‘logo’, later it was decided that no living animal should be made the logo. Instead, huge inflated jumbo-shaped balloons with a front leg up became the logo of the Games.